When you've just got in from picking the kids up from school, and they're cranky because they're hungry, here's a quick snack that will help quell their hunger, at least until dinner is ready. 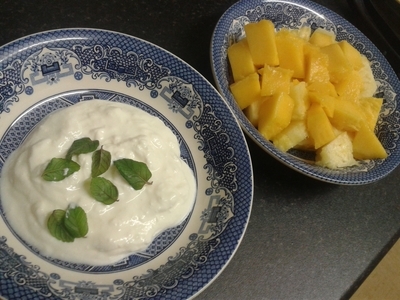 The balance of fruit and yogurt is perfect for hungry tummies. 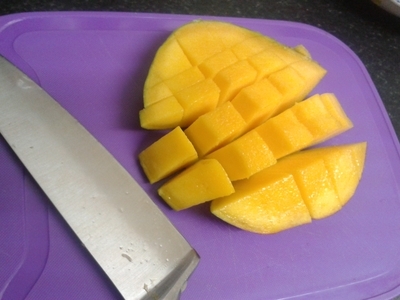 Ripe mango is fantastic for digestion, and combined with banana, it helps set the stomach up for the day - so this snack works as a little breakfast, too. I'd also like to add this fruit bowl, minus the yogurt (because it can be messy), is a perfect snack for little ones to take with them to school. It beats biscuits and crisps by a mile because fruit will give a natural energy boost, and will keep them satiated better than the high-salt and high-sugar packaged stuff. 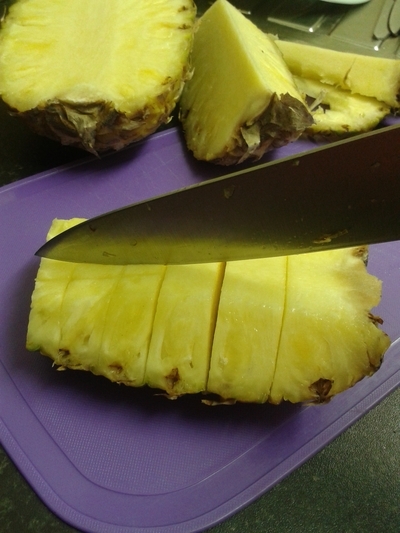 Chop the 'top' off the pineapple. 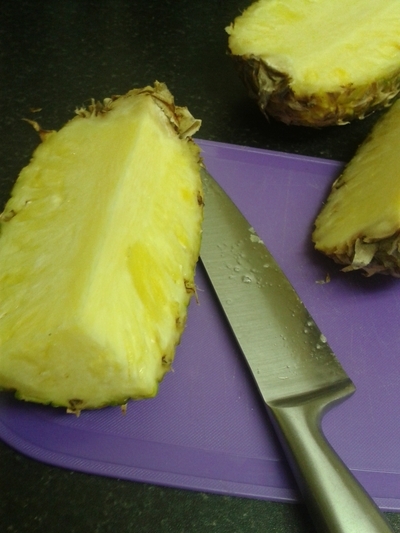 Slice the pineapple in half, and then quarter. Run the blade under 'core' of the pineapple quarter and remove. 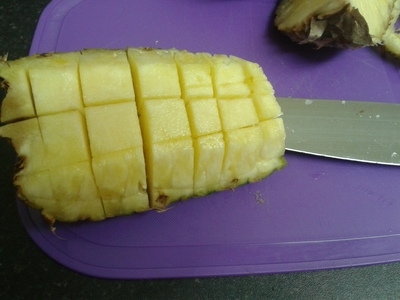 Then equally slice the pineapple horizontally, then vertically. 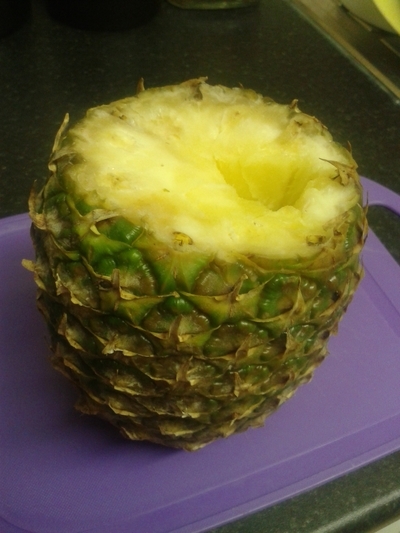 The pineapple should look like a 'hedgehog'. 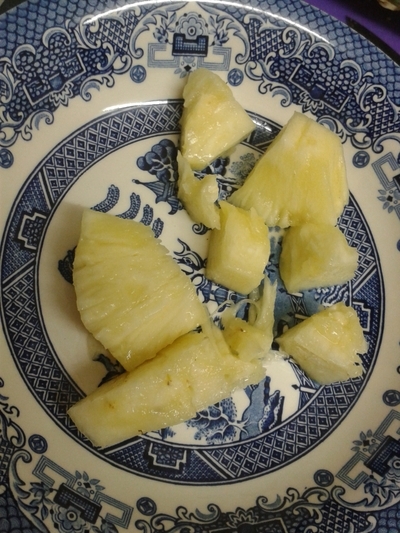 Place the pineapple chunks in the bowl. 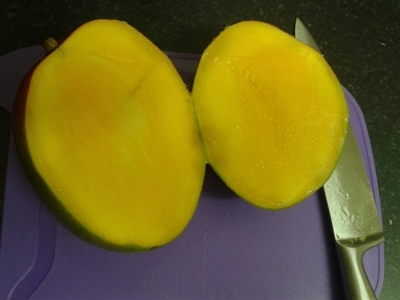 Slice the mango is half, on one side of the flat seed. 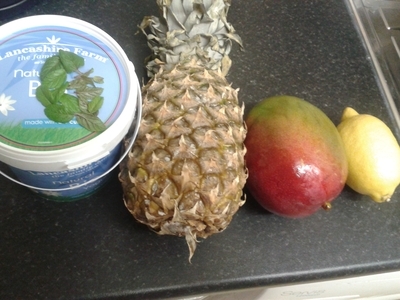 Score the mango flesh across in both directions. 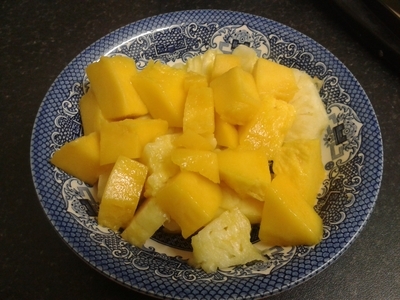 Push the mango chunks out into the same bowl as the pineapple. 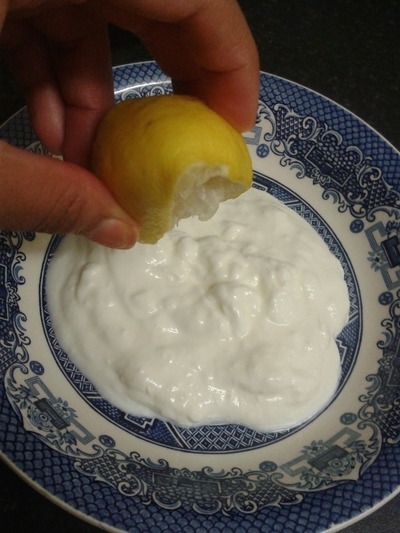 In a seperate bowl add the yogurt and a squeeze of lemon. 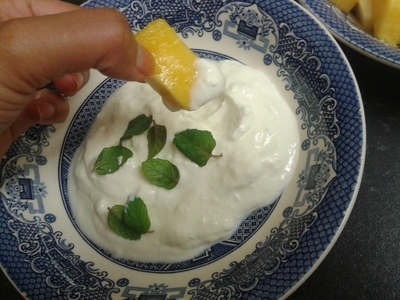 Stir and add the mint to garnish. This can be a bit messy, but that's part of the fun I think. I made this for my nephew and his two friends whilst my sister prepared dinner. 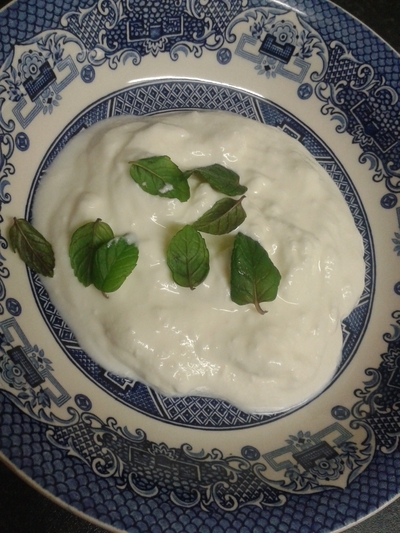 I served it in a large bowl and served the yogurt like a dipping bowl. Dipping fruit into bowls of protein-rich yogurt is great for little bodies, plus it shows them that food can be fun, and is something to be enjoyed with others. Or at least I thought my attempt at a fun snack was more successful than giving my nephew an apple, to which he would normally turn his nose up at. Objective achieved, I think.